Jeff Triplette got it right on Sunday. You know when you are in the NFL playoffs, because people step up. Players, coaches … and, yes, even the referees. Much criticized and often maligned, referee Jeff Triplette and his crew had an outstanding day. 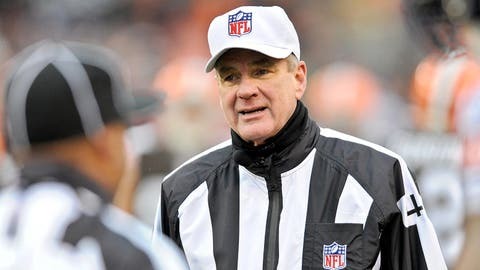 In my mind the league took a chance, assigning referee Jeff Triplette to this particular game, and maybe even to the playoffs in general because of all of his recent struggles. The reference to this particular game has to do with the replay reversal in the Cincinnati-Indianapolis game in Week 14, which gave Cincinnati a touchdown at the end of first half which they shouldn’t have had. There was a lot of pressure on Triplette, too, because most football fans felt like he didn’t belong in the playoffs. But Triplettte performed at a high level today, and so did the group he was with. It was not his crew, but he did have two other members of his crew with him Sunday. The other four were from other crews. There were four replay stoppages, three reviews and one challenge, and none led to reversals. And they were all correctly administered. There were nine total penalties, four against Cincinnati and five against San Diego. There were no blatant misses that I saw and some good decisions not to call pass interference during crunch time in the fourth quarter. As quick as we, and that includes me, are to criticize, we need to give credit where credit is due. It’s the type of performance the league is looking for all the time, but it’s especially good when it comes during the playoffs. PENALTY BREAKDOWN: San Diego 5-28; Cincinnati 4-38.